Hi guys. Hope you are having a nice weekend everybody. Today I will teach you how to pick a nice new toothbrush so you can replace the old one. Toothbrushes are an important asset for our daily dental hygiene so is only natural that we get the right one for the job. It is kinda impressive that not many people know this or how to take care of their toothbrush. So that is why today I will share some tips so you pick the perfect toothbrush next time you are in Los Algodones. For starters it is important to remember that you should change your toothbrush every 2 months. After using it 3 times a day you can expect that its bristles open up. Besides, it is the most hygienic thing to do, you will avoid many diseases such as gingivitis. There is nothing more useless than a toothbrush all wear down. So if your tooth brush is more than 2 months old, let’s buy a new one. The first thing to keep in mind when buying a new toothbrush is to look at the bristles. Many patients tend to pick one with medium or hard bristle. That is a mistake because it can wear down the tooth enamel and harm the gums. 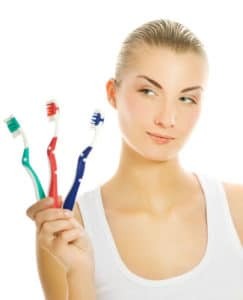 Pick a soft bristle toothbrush instead so you can take good care of your teeth. Along with this you should always use slow and gentle strokes when brushing so you avoid any damage. Next thing to look at is the handle. Pick one that is proportional to your hands and mouth. This is important because without comfort you will abandon your dental hygiene. Also it can affect your technique, tiring your hands in the process. Now, let’s talk about electric toothbrushes. 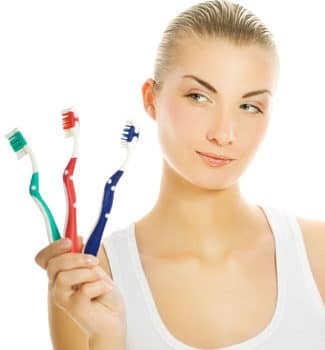 An electric toothbrush is fantastic for your dental hygiene because it makes the jobs easier. But take in mind that it is more expensive than a classic toothbrush. If you have the money go for it, but remember to change the head every 2 months too. Now that you have a nice shiny toothbrush brand new it is time to remember the basics. To ta ke care of your toothbrush you have to use it right. Use slow strokes when brushing as we said before so the bristles can last. Another thing is to clean your toothbrush after using it. it is very easy, just boil it in water for a couple of seconds and that is it. After this dry it well with a towel and store it in a dry place. Leaving your toothbrush moist is bad because it attracts many germs and bacteria. If you want them to stay away from your mouth, tore it nice. Do not forget to use dental floss and mouthwash every time you brush your teeth so you can get that perfect smile you always wanted. Maintaining a good dental hygiene is the key for having nice teeth. And with these tips you will be in the way to having perfect teeth. Complete it with 2 visits a year to your dentist and for more information for appointment, leave us a message or give us a call!